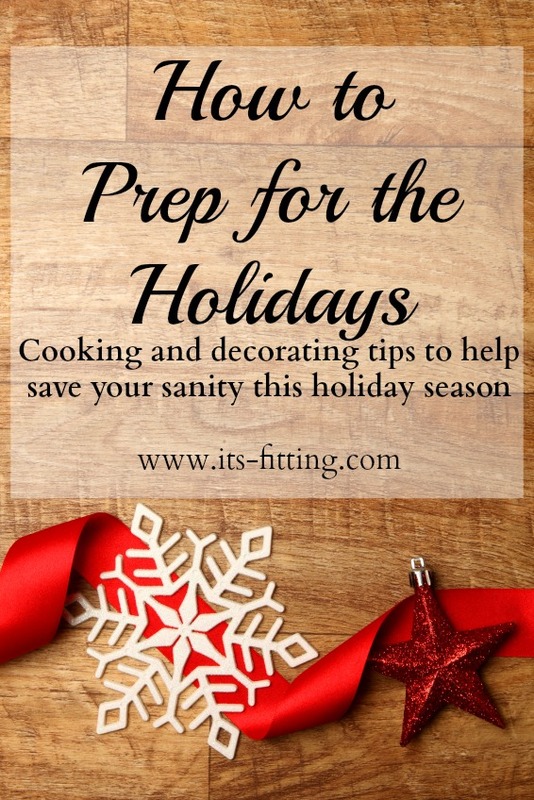 How to Prep for the Holidays | Recipes, Gifts and Decor tips! So the holidays are right around the corner and if you’re anything like me, they creep up on you and pretty much knock you senseless. I always find myself racing around at the last minute, scrambling to finish the 85,000 things I wanted to do and only having 15 more minutes to do them in. Ugh. The holidays can be hard. So I started thinking about things that I could do ahead of time. In the weeks leading up to Thanksgiving I make the pie crust that I’m going to use for my holiday pies. It’s really easy, totally freezable and the most delicious, buttery crust I’ve ever had. Do NOT be afraid of the butter. It’s the holidays after all. Once I’ve made the pie crust, I usually make the apples for my apple pie. If you haven’t seen my Make-Ahead Apple Pie Recipe, you’ve GOT to try it out. It’s so easy and you can prep it weeks in advance and throw it in the freezer. Use it with the pie crust and you’re good to go! 3) Borrow from the pros. Every year I use the Pioneer Woman’s Pecan Pie. It’s delicious, easy and totally freezable. Make it, freeze it up and thaw the morning of. 4) Did you know that you can take the Turkey, Mr. Main Event, out 3 days prior to the big day? Take it out, make sure that he’s all defrosted and keep him in your fridge until you’re ready to cook him. You can even take him out a few days prior and then brine him for a day or so… this makes him SO tender and juicy. And pulling him out of the freezer that early ensures that he’s not still frozen when you put him in the oven… horror of horrors. 5) Are you going to have house guests for the holidays? Then make food in advance! There are a ton of casseroles that you can freeze up and serve to your house guests. Or, whip up a ton of vegetable soup so that your guests have something light to nosh on before the big dinner. Here are a few of my favorite make ahead recipes that you can just cook in advance, freeze and defrost when you need them. Because there is NO need for additional cooking when the holidays strike. 6) Set the table at least 3 days in advance. I know it sounds crazy, but just do it. Now this is going to depend on where you are having your holiday, but when it’s our house, we sit in the dining room. That means that a few days prior I can set the table with most of the things I need. This helps you pull everything out, make sure you have all of the linens that you need and if you have to wash anything, you have some time. I of course do NOT put out the china or the waterford until the day of, since I have two small children and one of them LOVES to throw the football in the house. This kid could take out my entire wedding set in one bad throw or punt. Gah. Are you going to make any? I usually try and make some little gifts for people, be it holiday cookies or jars of apple butter. But if you want to start now? WHY NOT??? I usually make up my amazing sugar cookie dough weeks before I need it and throw it in the freezer. Then once I am ready to make and decorate cookies I just pop it out, bake them and decorate. SO much easier! I also make breads in advance, like my zucchini bread, apple spice bread or banana bread. Make them in small pans and throw them into the freezer until you need to give them. You can also make the Holiday Mint Meringues and freeze them as well! And how about Apple Butter or Applesauce? If you want to make it up and give it as gifts, you can either freeze or can it. You CAN can. Promise. And it looks really cute to give little jars with a festive holiday ribbon around it…. that you MADE YOURSELF. So very Martha Stewart of you. At the end of the day the goal is to take the pressure off. There’s only a few days till Thanksgiving, but a month until Christmas. So start prepping now and then you won’t be a crazed lunatic com December 23rd.